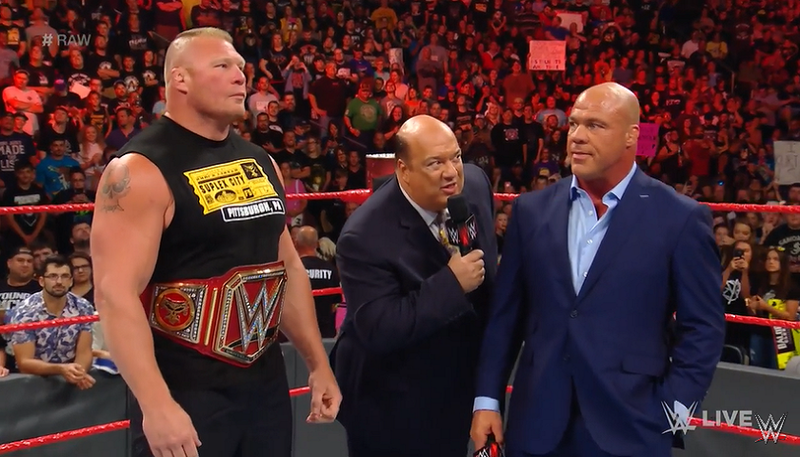 Did Paul Heyman hint at Brock Lesnar going back to the UFC last night on WWE Monday Night Raw? Before this past weekend’s UFC 214 fight card rumors began to swirl about a potential superfight between now current light heavyweight champion Jon Jones and the former heavyweight champion Brock Lesnar. Lesnar of course has returned to his professional wrestling roots with WWE, but after Jones’ victory on Saturday night the possibility of this potential matchup became more of a reality. Then last night on WWE Monday Night Raw, speaking on his behalf, Lesnar’s advocate, Paul Heyman, told “Raw” general manager Kurt Angle that if the Beast Incarnate fails to retain his Universal Championship at SummerSlam, they’ll both leave WWE. While this doesn’t exactly indicate that Lesnar is headed back to the UFC, it does play to the storyline. Lesnar is not currently in the USADA testing pool and will need to enter for regular testing before he is eligible for competition. A loss at SummerSlam allows Lesnar to leave and prepare for a return to mixed martial arts.